Life doesn’t stop when you’re unemployed. But what do the days look like in between leaving and finding a job? How do you keep your spirits up? What about those bills? And could it be that this time might actually be an opportunity for growth? Working When You’re Not considers these questions and more with a series of short chapters that range from serious to light-hearted. I wrote WWYN during my own ‘in between’ time (as a pastor, I’ve been in that neighborhood more than once), and have a sense for the kind of questions and concerns being there raises. My hope is that the book will encourage those who are going through this season; I think it’ll also be of benefit to their friends and family. “Perspective is critical in a crisis—yet perspective in a crisis is always in short supply. Dan Schmidt gives perspective to the crisis of being between jobs. With his heart on his sleeve and a wry grin he provides perspective that’s neither a pat on the back nor a kick in the seat of the pants; it’s truth served with a friendly smile. All of us will either want the book for ourselves or for a friend. “Dan Schmidt speaks from experience, and having been between jobs myself, I can say he speaks from understanding and compassion. This is a book of encouragement and hope for those who find themselves in the season of not working—and for those who know it’s always a possibility, which means all of us. “I’m quite certain I’ve never heard of, let alone read, a book on what to do when you’re out of work. 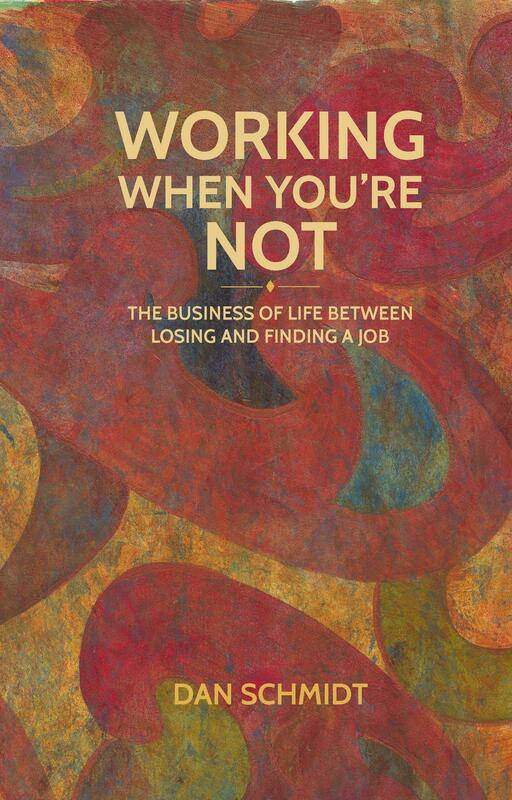 In Working When You’re Not, Dan has addressed a subject that most people have faced or will face if not once, probably many times throughout their lives. Reading the book is like sitting down with a mentor who has switched jobs, lost jobs, and been laid off and listening to them pour into you bits of wisdom and truth. Dave Jacobs, author, blogger, church consultant, and founder of Small Church Pastor. “In this book Dan is a kind guide, walking patiently with us through those most difficult of times: the days when we are unemployed, the periods of our life when income is not coming in. It is both sympathetic and encouraging and somehow gives me the sense that even the most difficult of paths will lead us home.